Beyond $130,000 ...a New Stretch Reward! An update for art lovers ...and a new pledge level! You did it. You took down $130K like it was some two-bit fighter prancing into your dungeon with practice weapons. The Creator Pack is opened up and we will be shipping those Kickstarter exclusive cards to everyone at the Player's Choice level and above, along with the digital "create your own card" kits. Tonight's post finds us with only five days left in the campaign. We've set the next stretch goal at $160K. It's a tall order, we know, but based on what we've seen out of you guys in the past three and a half weeks, we think we can make the stretch. So, what happens if we hit $160K? Something pretty special, we think. For all of our backers at the Extra Life level and above, we've always promised that in mid-2013 we'd ship a prototype version of our 25-card mini-expansion, Tools of Hero-Kind. The cards in the prototype were going to be physical, but they weren't going to be final, because the whole point was that you'd be playtesting them. It was, we admit, a little confusing. So we've sweetened the deal. If we hit $160K and you are an Extra Life backer or above, we're going to upgrade your prototype version of Tools of Hero-Kind to the real deal. Let's say that again so we're clear: if you're an Extra Life pledger, we're going to be sending you a free copy of the foil bag-wrapped, fully playtested, final production version of the Tools of Hero-Kind mini-expansion instead of the prototype. This will be the same version that we're later selling in stores. We'll ship the expansion in mid-2013, but now you'll have a chance to playtest the work-in-progress version even earlier, with a print-and-play PDF version available to all our Extra Lifers (and above). In fact, we'll send the first playtest PDF soon after you get your copy of the base game. We hope this is as exciting to you as it is to us, because sending you the final mini-expansion is not something we could have done without having gotten to where we are on Kickstarter. We truly needed your support to be able to make this financially viable. Just to whet your appetite, here's a look at an early version of one of the magical "Item" cards from Tools of Hero-Kind. 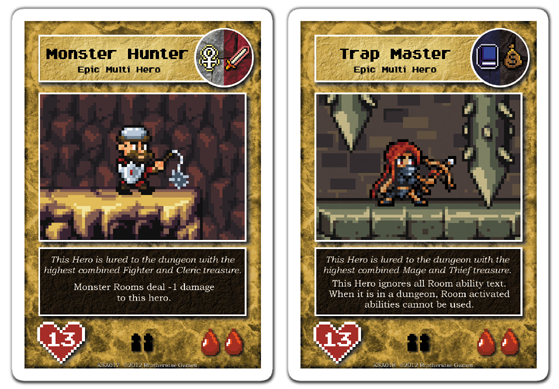 With the introduction of Item cards, Tools of Hero-Kind will transform the adventurers exploring your dungeon. They'll go from being a resource that you harvest into an undeniable threat. Magical weapons, armor, items and scrolls will attach themselves to Heroes as they come into town and confer their "Power-Up" abilities. Of course, with bigger risks come bigger rewards. Should you manage to defeat a hero carrying an Item, you'll be able to use the one-time "Reward" effect of that item to further your own nefarious goals. For Unlimited Lives backers who are thinking they already had a copy of this expansion coming to them, that's true, but we still consider the Unlimited Lives pledge to be the best value of our various pledges, because we are dead-set on releasing expansions for years to come. Back at $12,000 it was a very uncertain reward, but it has become a dependable investment. For those of you backing below the Extra Life level, we'd be thrilled to see you upgrade to the Extra Life to get Tools of Hero-Kind. But for those of you who really can't increase your pledge at the moment, or who are already pledged above the Extra Life level, we decided to provide another reward. We were inspired by one of our favorite ideas already coming out of the Boss Monster backer community: "Hybrid Heroes." So, if we hit $160K, every backer at the Player's Choice level and above will receive two Kickstarter exclusive Epic Multi Heroes: The Monster Hunter and The Trap Master. We may make some tweaks to these cards before they go to print (there have to be some surprises in February, after all), but we think these two heroes will add a new level of challenge and fun that you guys -- and only you guys -- will be able to enjoy. That's it for now, Boss Monsters. Can we make $160K? Might there be more stretch goals beyond that one? Only five days to go... we'll see what you can do. Wow! We wake up to see that $130K has been destroyed! Thanks to all of you for helping us get to where we are, and a hearty congratulations to the eight backers who claimed the Boss Monster Art Pledge levels. Brother Two and I have been talking for some time about what to do for the $160K stretch goal, should we be so lucky as to make it. We've had an idea in place for some time that came right out of the ideas we've been seeing and yes, listening to, on the comment boards. But last week Brother Two came to me and said, "I want to do something really special for our most loyal backers." He showed me. "You're nuts," I said. "We can't afford that." "Let me crunch the numbers," he said. He's still crunching the numbers, but we'll get back to you later today with (I believe) a new and improved stretch goal that has something for everyone who's gotten behind this Monster, big and small. As we enter our final week, achievement of our $130,000 goal is imminent. But it's a bit too early to talk about the $160,000 stretch goal, so tonight we want to introduce a cool new limited pledge level for our most passionate backers. We've been lucky to work with an outstanding group of pixel artists on Boss Monster. Francisco Coda is hard at work on our Hero cards, Kyle Merritt has designed many of our deadliest Traps and Monsters, and David Nyari gave us the backgrounds for all our Rooms. Still more sprites have been contributed by artists like Alexander Olsen, Beau Buckley, and Andres Sanabria. Finally, the game's iconic Boss cards have all been designed by the very talented Katrina Guillermo. Fans of Katrina's artwork will love our latest limited pledge level. Shortly after this update goes live, we will be updating the project page with eight new pledge levels: KING CROAK, ROBOBO, GORGONA, CLEOPATRA, CEREBELLUS, SEDUCIA, DRACULORD and XYZAX. For $245, you can gain the ultimate Boss Monster status symbol: sponsorship of one of the game's core eight bosses. To be clear, this will not result in any changes to the actual cards. Nothing's being renamed or redrawn, because we love these cards just as they are. But with this pledge level, in the eyes of the Boss Monster community, you will be more than just another player. You will be a Boss. As much as we love the pixel art in Boss Monster, sometimes our static little sprites just beg to be a bit more animated. So for a handful of the cards in the game, we've included alternate art that provides a bit of a "before-and-after" scene. 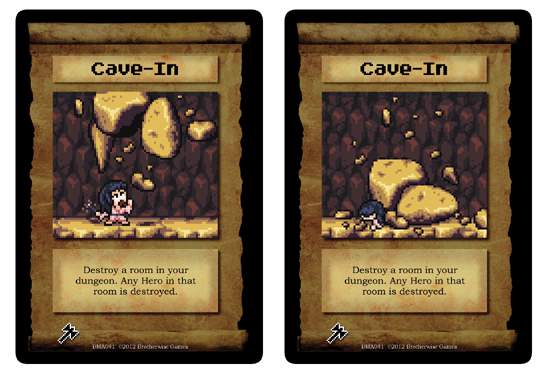 First up is Cave-In, a Spell card that works a lot like the Bottomless Pit room. If you're willing to give up a room, you can take a Hero down with it. Cave-In tends to be overkill for an ordinary Hero, but it can sometimes be the only way to bring down an Epic Hero. Here, we can see a magic wand-wielding wizard in a pink kimono. The poor thing doesn't stand a chance against the Cave-In. Our favorite alternate-art card is Teleportation. This card was featured in our gameplay video, but you may not have noticed that it has two different illustrations. 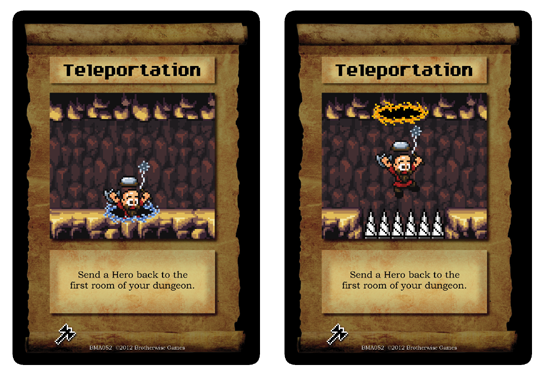 Teleportation sends a Hero right back to the first room of your dungeon, where they'll have to run the gauntlet a second time. So it's only fitting that we see the unhappy aftermath of the adventurer's involuntary voyage. Our alternate-art cards aren't too common, and sometimes they're very subtle, but they're another fun way to bring the game's retro look to life. Thanks to artist Kyle "Chesu" Merritt for the great imagery in both of these cards! To check out the new pledge level, be sure to visit our main project page! Getting an Extra Life in most old videogames was pretty satisfying. It came with that nice “extra life” ping and the knowledge that you’d be able to stay in the game a bit longer. Getting the Extra Life in Boss Monster doesn’t come with a nice pinging sound, but it will keep you in the game longer. 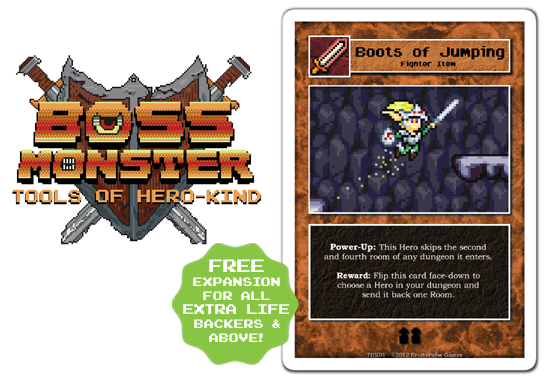 The Extra Life pledge level with Boss Monster doesn't just get you an advance prototype copy of our first mini-expansion, "Tools of Hero-Kind," it also allows you to become a playtester with Brotherwise Games, and become a part of our gaming community. •	Pre-release print-and-play access to Brotherwise games, and more! We’re blown away by the initial success of Boss Monster, and we want you to feel like you’re a part of that success, because you are! Pledging at the $40 level means you’re going to stay a part of Boss Monster and Brotherwise for years to come, and have to opportunity to help craft games that you want to play. Ehrmagerd! Look at all the pretty statues! EHRMAGERD!! SNAKE LADY!!!! Gorgona is one of our favorite bosses. She’s smart, sassy, and knows what she wants out of life. And what she wants is to reduce heroes to crude granite and lime stone likenesses of their former selves. What a catch! Gorgona is a thief-luring boss who, with 650 XP, runs at the lower end of the experience point scale. She makes up for that low XP with a doozy of a Level Up! power that instantly grabs her a soul from a hero in town (or two if she nabs an epic hero when she levels). Quick, clean, no fuss, no muss. What more could you ask for in Boss? 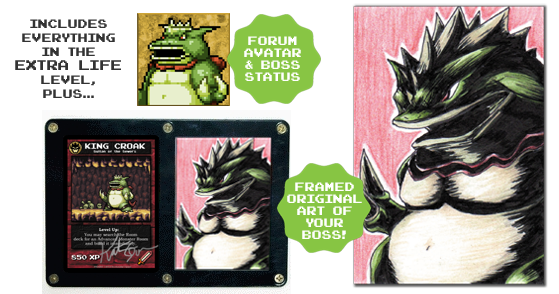 Last week to get a KS exclusive Boss Monster 10-doh! If you haven't gotten your 10-doh yet, this is your last week to do so. This Boss Monster 10-doh made by Squid Kids Ink will never be offered again. Just add $20 to your pledge (or $30 for international backers) and let us know with a message that you'd like one added to your pledge. Shipping included! Where are your dragons? We got your dragons right here. No card points out the central tradeoff in Boss Monster better than Dragon Hatchery. Is it better to lure a broad sample of heroes in with treasure, denying your opponent access to those heroes, or is it better to focus on a sub-set of heroes but maximize your ability to kill those heroes when you do get them. It’s all about attractiveness versus deadliness. Dragon Hatchery is all attractiveness and no deadliness. It contains one of each of the treasure types, but does zero damage. This offers both costs and opportunities that the savvy Boss Monster will have to account for. One often overlooked benefit of Dragon Hatchery is its utility as a base upon which to build an advanced room. Because it contains one each of the four treasure types, ANY advanced room in the game may be built upon it. So, get a nice warm cave picked out, stock it with some cozy gold pieces, and find yourself a pregnant dragon. Watch out for that last bit though. If you think their grumpy normally, you should see them in their last trimester.